Let me tell you, let me tell you, and let me tell you twice – my kids love these Cinnamon French Toast Sticks for the Freezer. 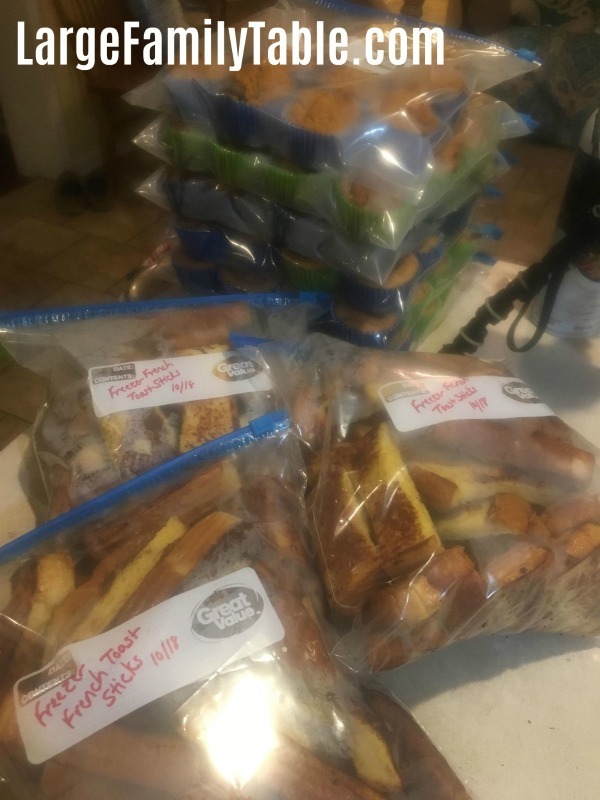 I made over 280 of these freezer french toast sticks on my last big make ahead breakfast freezer meals day where I made over 25 breakfast freezer meals for our family of ten. 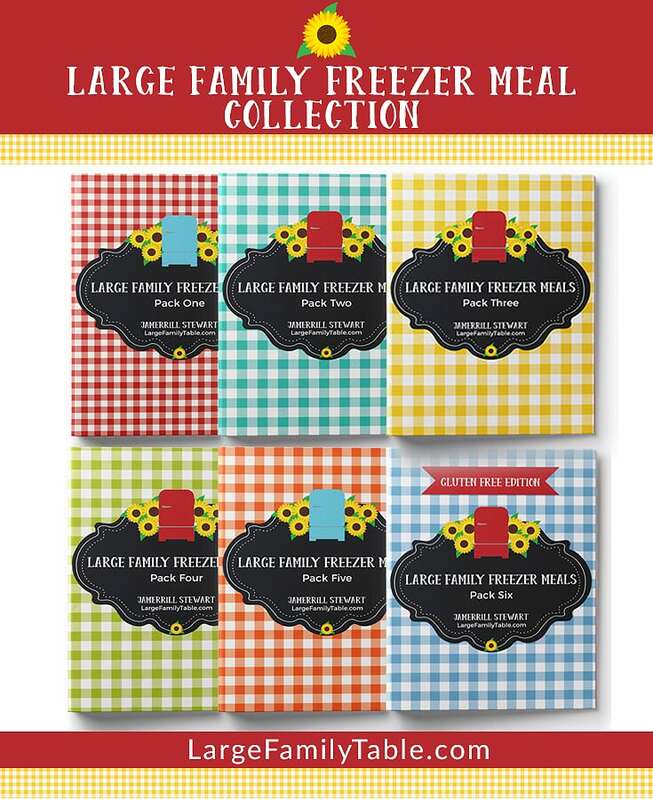 I was heading out of state for a week and wanted to fill the freezer for my husband and six of the eight kids who would be at home. I knew having the freezer stocked full of breakfast freezer meals would be extremely helpful not only while I was gone, but for while we were finding our footing when I returned home. Whether you’re a working mom, traveling mom, homeschooling a houseful mom, mom-t0-be, or whatever situation you may find yourself I’m sure you’re busy, busy, busy. 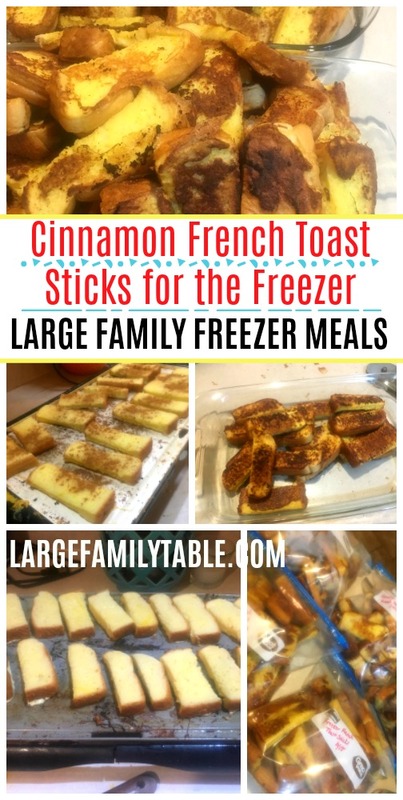 Try adding these easy french toast sticks as a quick freezer meal for your family! The secret to these fantastic and easy Cinnamon French Toast Sticks is using loaves of Texas Toast sandwich bread. I was able to find these at my local Walmart and added them to my grocery pick up order. 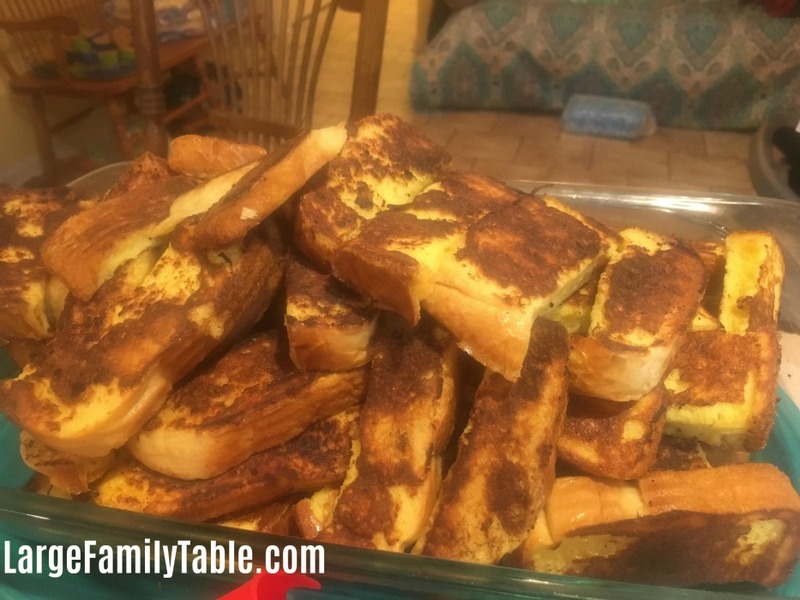 French Toast Sticks are a kid friendly freezer meal and a favorite for my 8 kids. I hope this French Toast Stick recipe helps you feed your people! 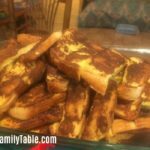 This large family recipe makes 288 French Toast Sticks. Mix eggs, milk, and vanilla is large mixing bowl. Cut each piece of Texas Toast bread into three strips. I used a pizza cutter to zip through each slice quickly. Quickly dip each French Toast Stick into the each batter into the egg mix and place on heated pans or griddles. Once each French Toast Stick is completely cooked place on a platter or cooling rack to cool. After French Toast Sticks are cooled you can place in labeled gallon freezer bag and freeze up to 3 months. If you have the freezer space you can also do a flash freezer on your French Toast Sticks. I didn’t have the freezer space to do flash freezing on this freezer cooking day. To flash freeze just place your pans of French Toast Sticks in the freezer and let freeze for up to an hour. Then bag in labeled freezer bags. See all the French Toast Stick Freezer Meal action in this recent 25+ Make Ahead Breakfast Freezer Meals video! When you’re ready to serve your family French Toast Sticks for breakfast just set a frozen bag or two out the day before from the freezer into the refrigerator. One breakfast morning just reheat a plate full of French Toast Sticks for 1-2 minutes. Serve with syrup and fruit! *You can bake your french toast sticks in the oven. I had my oven full of muffins and breads. We cooked these French Toast Sticks on two griddles. Click here for more large family breakfast recipes!